HARRISBURG – The Wolf Administration is urging Pennsylvanians to support the local food banks following the partial federal government shutdown. “Millions of Pennsylvanians continue to feel the ramifications of the partial federal government shutdown,” said Miller. Even though the federal government is back to business as usual, many of the impacted families are still left wondering where their next meal will come from. Whether they are federal contract employees that are unsure if they will receive back pay, or one of the 1.8 million Supplemental Nutrition Assistance Program (SNAP) participants in Pennsylvania, charitable food organizations will likely continue to face an increased demand to help meet this need. In order to issue February benefits during the shutdown, DHS had to issue February SNAP benefits early, on Jan. 16 and 17, rather than the typical issue date within the first 10 business days of the month. March benefits will be issued from March 1-14, which forces SNAP recipients to make the February benefit last nearly two months. 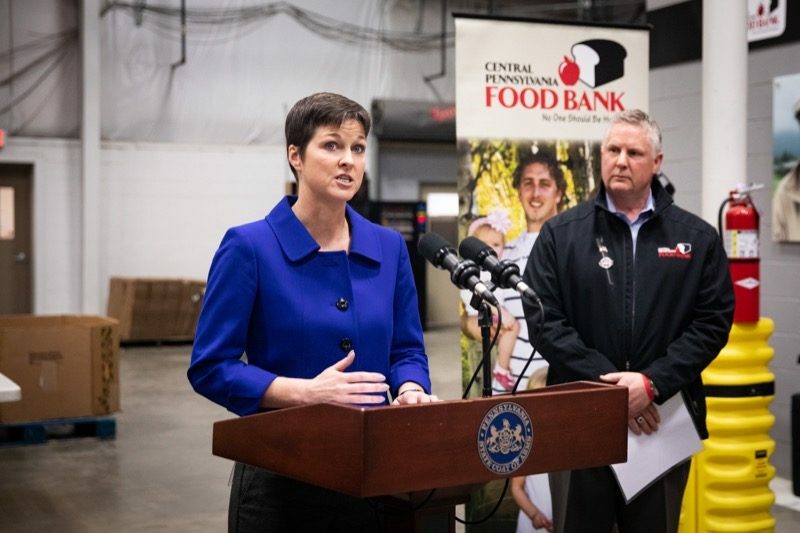 Miller and Cook urged all Pennsylvanians to continue to support their local charitable food organization, as they prepare for what could be a continued and dramatic increase in need. “Pennsylvania’s charitable food system is built on the notion that food connects us, sustains us, and is something that everyone – no matter who they are or where they live – deserves access to,” said Cook. “It is important that we band together during this challenging time to support our friends and neighbors struggling to put food on their tables. Pennsylvanians looking to help their local charitable food organizations can do so by making food and monetary donations. Most-needed food items are often listed on an individual food bank’s Web site. Additional in-person volunteer support will also be needed as charitable food organizations work to keep up with the increased pace. “We do expect the later part of February to be very busy as SNAP benefits run out and clients seek more food assistance from our Partner Agencies,” said Joe Arthur, executive director of the Central Pennsylvania Food Bank. Arthur also expressed concern that the current federal government funding resolution is set to expire on Feb. 15. “Feeding Pennsylvania’s member food banks have worked overtime to serve the needs of those impacted by the government shutdown as well as the needs of the 1.6 million Pennsylvanians facing hunger every day. “We are grateful for the donors and volunteers that make our work possible, but we know that SNAP is the backbone of the charitable food response,” said Feeding Pennsylvania Jane Clements-Smith. “For every one meal our food banks provide, SNAP provides 12, making it difficult to nearly impossible for us to meet the needs when benefits are interrupted.